This is a dressy dress shirt collar for your dog. 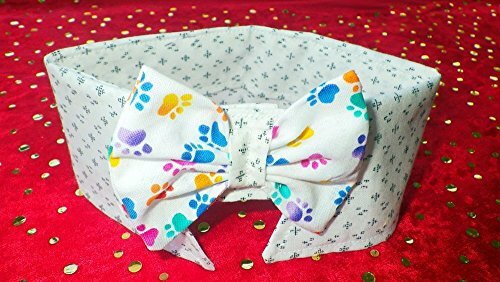 It has a cotton bow accent with colorful paw prints all over. The fabric of the shirt collar is a unique vintage Japanese design which can be hard to find anywhere else. This has a velcro closure for easy on and off dressing. Machine wash but handwashing is preferable to retain shape. Size is approximately 13 inches around the neck. Please measure your pet's neck and consider the fluff factor before ordering.